When I picked up my fourth grader from Central Avenue School this past week, we headed back in to check the Lost and Found table for her jacket she forgot at recess. As she stepped into the school lobby, she paused on a large round sticker on the floor, closed her eyes, said "my mom," and looked up at me with a smile. "Now it is your turn, Mom," she said. "Say someone or something you are grateful for." I had first heard of these "Gratitude Spots" a few weeks before at Back to School Night, when Mr. Shugrue, the CAS Guidance Counselor, introduced the two-week long "Gratitude Campaign" the students would start on October 2. This campaign is part of a larger initiative called Look For The Good Project, a Connecticut based non-profit organization that has inspired thousands of kids nationally and internationally to uplift their school communities with gratitude and kindness. CAS is the first school in New Jersey to launch their own affiliated gratitude campaign. There are several aspects of the campaign. The orange "Gratitude Spots," such as the one where my daughter and I paused, are large circular stickers labeled "You're on the spot! What makes you grateful?" As students pass over the spots throughout the day, they are encouraged to stop, take a moment, and think about something or someone that they are grateful for in their life. Further along the hall, my daughter and I came to one of the several "Gratitude Walls" throughout the school. Students wrote sentiments of gratitude, kindness and inspirations on colorful sticky notes, and added them to the wall. The wall we first saw was in the kindergarten and first grade wing of the school. We spent several minutes reading the notes, which contained precious drawings and sentiments, including "I am gretfoll for my techr," "I am thankful for my grammas home made lasanya," and "I ma than kful my famle." How can you not smile after reading these? With each of the 500+ CAS students writing one sticky note per day for ten days (in addition to CAS parents and caretakers who could add notes to the board in the vestibule outside the main office), the school expected to have a rainbow of over 5,500 sentiments on display. They were definitely on their way to that, and possibly more, by the time we stopped by. In addition to the walls and spots, hand-picked fifth grade ambassadors spread more kindness throughout the campaign by handing out "Kindness Cards" each saying "You Matter." The children were encouraged to tell other students why they matter and the recipient then passed it along to someone else. Students also took it upon themselves share their appreciation with their classmates in other ways, as I saw when I found a note from a classmate in my daughter's backpack: "Dear Becca, You are funny because when we were at picture day, you were signing and dancing in front of me and I thought it was funny." My daughter takes great pride in being funny, so it was a great compliment for her. 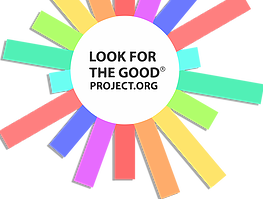 The goal of the Look For The Good Project is to emphasize kindness, compassion, and acceptance among elementary school children, which in turn aims to reduce bullying. 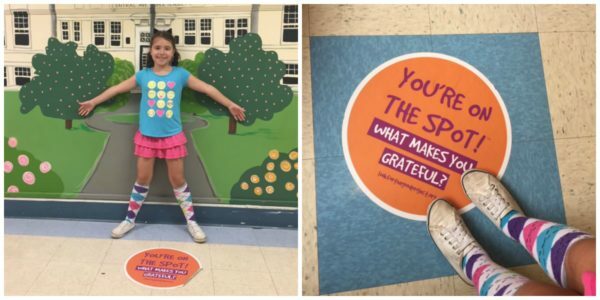 Being able to experience the simple Gratitude Spots, Gratitude Walls, and Kindness Cards with my daughter showed their great impact in helping students accept and appreciate what they have, who they are, and also each other.